Knorr® Liquid Concentrated Bases deliver versatility, scratch-like cooking and exceptional flavour, colour and aroma—with shorter prep time and greater flexibility. Deliver simple, clean food with ease. Knorr® Bases are reinvented by our chefs with your kitchen and your customers in mind. Vegetable juices (water, concentrated juices of carrot, celery, onion, tomato, cabbage juice), maltodextrin, salt, sugar, yeast extract, garlic powder, spice, mushroom extract, natural flavour. 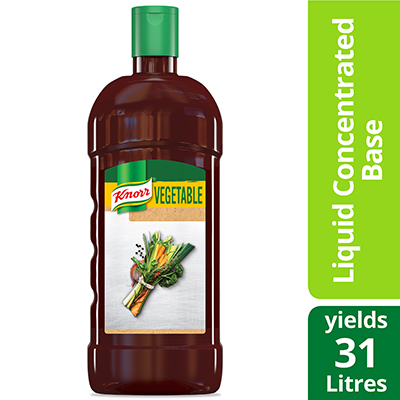 Add rich flavour and aroma to your menu items while minimizing kitchen prep time with Knorr Professional Liquid Concentrated Vegetable Base. Designed by chefs for chefs, this liquid vegetable broth concentrate offers a faster, more flavourful alternative to paste vegetable soup bases. The soup mix instantly dissolves when added to boiling water, creating a delicious, aromatic vegetable broth that closely approximates a from-scratch recipe. Use it as a vegetable stock for a hearty stew, or as a starting for a rich gravy. Ideal for restaurants, catering services, and other fast-paced kitchen environments, this liquid concentrated vegetable bouillon brings premium quality and outstanding efficiency to any culinary establishment. Combine base with boiling water for a rich instant stock. Shake well before use. Speeds production, improves recipe consistency and reduces product waste. Increase customer base by offering gluten-free dishes with no MSG Added. Saves refrigerator space and can be stored on the line because product is shelf stable. Use to make stocks for soups, sauces and gravies. Use as a glaze for vegetables during roasting, grilling, broiling and sauteeing. Also use to add flavour at any stage of the cooking process.